The Erie Canal flows once again through downtown Syracuse. Or shall I say, rather, that it now exists as an abstract representation of its former self. Downtown Syracuse, as it currently stands, feels like it came into being in an entirely arbitrary location. 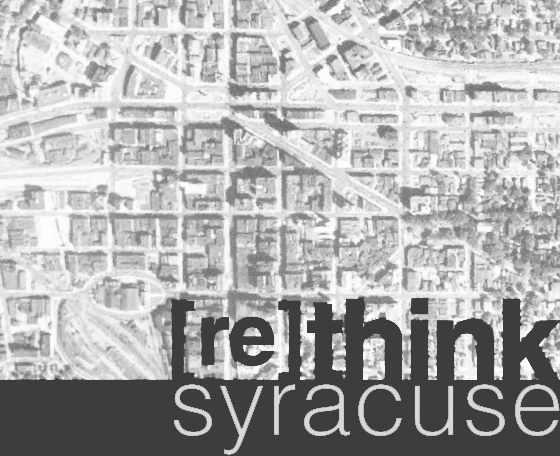 Most cities are sited and grow due to an important geographic feature, such as a river or a lake, but Syracuse, to anyone who doesn't know of its history, seems to lack any such feature. The Erie Canal [and Oswego Canal too] was the city's waterway and raison d'etre, but after it was filled in the 1920's, it began to fade from people's minds. Somehow, this history needs to be told; the former canal needs to be expressed and celebrated. After months of brainstorming, conceptualizing, dreaming, envisioning, and any other associated loaded verb you can think of, the lot of us at the Public Arts Task Force concocted a plan: Short of physically redigging the canal, we felt the best way to do this in an interesting and unique way was through painting a portion Erie Boulevard the actual width of the canal that it replaced. The resulting design is a barcode, understood in its entirety from above, but primarily experienced from the street level where it appears to be subtly shimmering water as one looks down its two-block length. By connecting the Erie Canal Museum [a former canal weighlock building] to Clinton Square [the traditional heart of the city focused around the former canal] in this manner, it helps people understand the important geography that the canal both occupied and formed. 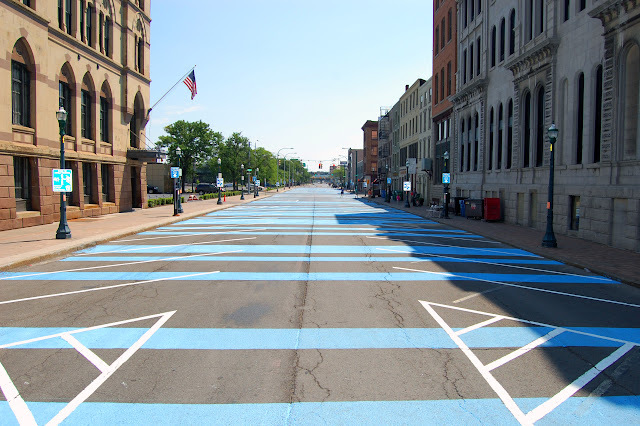 The end result, entitled arterie and created over three days with 55 gallons of street-grade paint, 18 paint rollers, and countless volunteers, has received an overwhelmingly positive response. Everyone -- from visitors, to artists, to children -- can understand and appreciate the canal's manifestation in its most literal sense, while the pattern adds a layer of complexity and flexibility for expansion in the future. And speaking of expansion, please share this project with everyone both near and far -- if enough attention and momentum builds, we would love to push beyond the current edges of the project to recreate more and more of the Erie Canal [and maybe even the lesser-known Oswego Canal too] throughout the city. Who knows... with enough attention, maybe the arterie could give rise to the actual canal once again?